Any organization or company that stores, processes, or transmits protected health information (PHI) needs to comply with HIPAA regulations. PHI is defined by 18 HIPAA Identifiers. Data containing any of these identifiers is considered PHI and falls under the realm of HIPAA regulations. Healthcare providers, Health plans, Healthcare clearinghouses are required to comply with HIPAA regulations. Healthcare vendors and companies that handle PHI of providers are considered business associates (BAs) and must also follow HIPAA regulations. This means that digital health companies or even companies that provide productivity software such as CRM or ERP solutions must comply with HIPAA if they handle PHI. 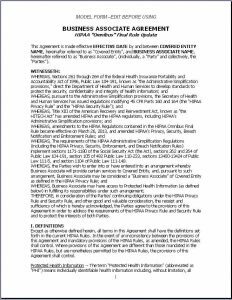 Healthcare organizations and companies must sign a business associates’ agreement (BAA) with any vendors that will handle protected health information (PHI). This means that organizations must have a BAA in place for all 3rd party companies, software solutions, and cloud platforms that will store, process or transmit PHI. Public cloud providers typically follow a shared responsibility model where HIPAA responsibilities are defined for cloud providers and clients. Signing a BAA is the first step towards compliance, organizations have many other responsibilities detailed below. Roles/Defining A Security Officer + Privacy Officer – Teams must define a security officer and privacy officer to oversee HIPAA compliance technical controls and administrative processes. Risk Management – Organizations must conduct a risk assessment at least once a year. Teams should also being analyzing compliance risks on a recurring basis. Incident Response – Organizations must have a process in place for responding to potential HIPAA breaches and security incidents. System Access – Organizations must define how systems with PHI are secured and must keep access to PHI to only necessary staff and users. Disaster Recovery – In case of data availability issues, organizations must have a process for recovering PHI data and restoring service availability. Employee Policies – Organizations must define how employee HIPAA training is conducting, and how employee incidents are managed. Facility Access – Organizations must define how PHI data will be physical secured, through security such as locked servers and facilities. Facility maintenance and employee access must also be defined. Security teams must implement specific solutions for securing PHI and fulfill HIPAA technical safeguard requirements. Below is a list of technical safeguards and controls that must be implemented for HIPAA compliant software and solutions. Access Control – Systems and applications must implement access control and limit PHI access to only necessary individuals. This means user and role management must be implemented for systems holding PHI. Encryption – PHI must be encrypted in-transit and at-rest. This means that servers and cloud services that handle PHI must have encrypted disks and must utilize SSL/TLS standards for transmitting data. Audit Logging – Audit logs must be collected for events where PHI is accessed or modified. Logs are collected from different services and must be reviewed on a frequent basis. Backup and Disaster Recovery – In order to avoid data-loss from accidental deletion or malicious behavior, organizations must implement procedures for backing up PHI data and recovering from potential incidents. Intrusion Detection Systems (IDS) – Organizations must look for suspicious network behavior and develop a process for identifying protentional network intrusion. Vulnerability Scanning – Organizations must implement a process for identifying vulnerabilities and patching systems. Operating systems (OS), software, and applications should be scanned for vulnerabilities and updated frequently. There is no silver bullet for making your software HIPAA compliant. Organizations must implement all necessary administrative and technical requirements in order to maintain HIPAA compliance. With that said, organizations don’t need to tackle HIPAA compliance on their own. 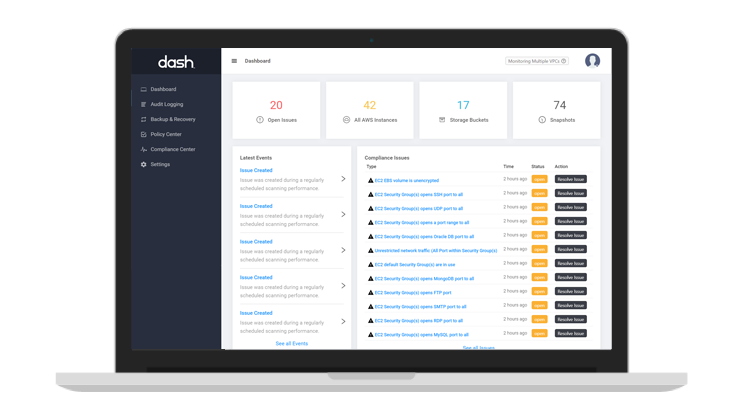 The Dash Compliance Automation Platform provides startups, healthcare vendors and healthcare organizations with a software solution for automating HIPAA compliance configuration, monitoring, and management. With Dash, development teams can use existing cloud services with Amazon Web Services (AWS) to build develop HIPAA compliant software and healthcare applications. Dash enables teams to create custom HIPAA administrative policies. Policies are connected into technical controls and Dash monitors your organization’s cloud environment through continuous compliance monitoring. With Dash, organizations can unlock the public cloud for healthcare software development and build a robust security program.